graduated from Bratislava’s Academy of Performing Arts in 2007 in choral conducting, having studied under Prof. Blanka Juhaňáková. In 2006 he was given the opportunity to cooperate with the Slovak Philharmonic Choir as Assistant to the Principal Choirmaster of the Slovak Philharmonic Choir, Blanka Juhaňáková. Since the 2013/14 season he has been the Choirmaster of the Slovak Philharmonic Choir. Mr Chabroň has prepared the Slovak Philharmonic Choir for performances of a great many vocal and instrumental works, including Ravel’s Daphnis et Chloé, Debussy’s Nocturnes, Haydn’s The Creation, Berlioz’s L’enfance du Christ, Mendelssohn’s Lobgesang, Suchoň’s Psalm of the Carpathian Land, Puccini’s Messa di Gloria, Mozart’s Requiem, Shostakovich’s Symphony No. 13 (Babi Yar), Szymanowski’s and Rossini’s Stabat Mater, Stravinsky’s Perséphone and Oedipus Rex, Janáček’s Glagolitic Mass, Britten’s War Requiem and Schönberg’s Gurrelieder. He has conducted the premieres of Krák’s Missa Pro Defunctis, Berger’s Missa Pro Nobis, Piaček’s Apolloopera, Wirth’s Carmina austriaca and others. 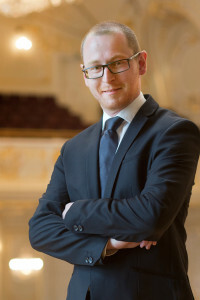 Over the course of his tenure at the Slovak Philharmonic Choir, Mr Chabroň has collaborated with a number of renowned conductors, including T. Guschlbauer, D. Gatti, L. Zagrosek, P. Schreier, E. Villaume, S. Baudo, N. Ballatsch, Th. Lang, F. Haider, L. Svárovský, P. Altrichter, R. Štúr, Ch. Campestrini, S. Bychkov, J. Conlon, R. Weikert and others. The pinnacle of his career has thus far been the study and preparation of Schoenberg’s Moses and Aaron for the Opera House in Zürich in 2011, with the premiere conducted by the famed conductor Christoph von Dohnányi, and preparation of the Slovak Philharmonic Choir for opera productions of Mussorgsky’s Khovanshchina and Boris Godunov at the Vienna State Opera. He has conducted Slovak Philharmonic Choir concerts in Hamburg, Bratislava, Žilina and Piešťany. In the 2017/2018 season he cooperated with the BBC Singers, Vienna State Opera, Monte-Carlo Philharmonic Orchestra, Dortmund Philharmonic, Tonkünstler Orchestra and RAI Torino Symphony Orchestra. During the 2018/2019 season he is working with the Vienna State Opera, Bruckner Orchester Linz, Royal Opera House Muscat in Oman and the Tonkünstler Orchestra.